Twitter announced on Good Morning America this morning that its new music service will become available to all users on the web beginning today. The service is meant to help Twitter users discover new music and is available online and through a dedicated iPhone application. The service works similar to Twitter.com, and is organized into tabs that offer different functions. The first two tabs focus on trends across Twitter as a whole: the Popular tab shows music that's trending across Twitter; and the Emerging tab reveals "hidden talent" that might otherwise be buried in Twitter. The second two tabs focus on the user's individual tastes: the Suggested tab recommends artists that are similar to those the user already follows on Twitter; and the #NowPlaying tab shows the songs that the user's friends are listening to or tweeting about. According to ABCNews' Joanna Stern, the iPhone application is integrated with Rdio, Spotify, and iTunes, and allows users to listen to songs without leaving the app or web page. Songs are shown in a grid, which the user can tap and then listen to complete with animated CDs spinning in circles. Rdio and Spotify users can listen to the entire song, while iTunes users can only hear a 90-second preview. Twitter is still working to forge relationships with other streaming music services to expand Twitter Music's catalog and reach. 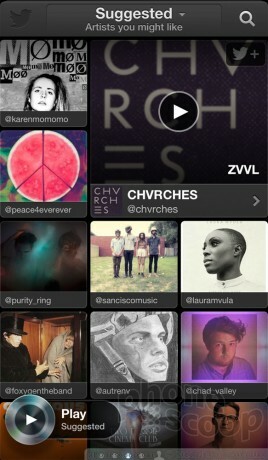 The iPhone application will reach the App Store later today; there is no Twitter Music application for Android devices. Having another person, or an App suggest music to you is like a drive-thru for a fast food resturaunt recommending what you should order off the menu. As Jack Black put it - Please don't offer me anything, I'll tell you what I want. I have almost never found anything close to what I like based on suggestions. Probably a waste of time, you'd find more you like using an old fashioned frequency modulation radio.